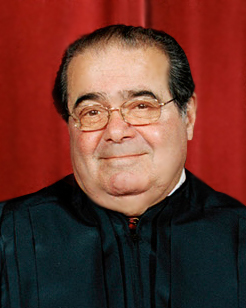 New York Feb. 15 – The residents of Hells’ most exclusive gated community, Pond ’O Puke were up in arms today at the thought that Antonin Scalia would be shortly moving in. Ethel Satan, wife of the Lord of Hell, was seen frantically running around trying to calm the angry denizens of Pond ‘O Puke who are up to here with disgust – literally – at the thought that Scalia might shortly be wading among them. Scalia, with no hope of redemption or purification, bypassed Purgatory and was moved swiftly up to the head of the long, long, line waiting at the down elevators to descend to their new digs. The Grim Reaper, who had the unenviable task of taking Mr. Scalia, had to deal with Scalia’s raging unwillingness to go gently into that good night by offering Mr. Reaper his first born. Said Mr. Reaper; “To say this was not a graceful exit is a gross – and I use this word advisedly – gross understatement. He first tried hiding under his robe. And then he tried hitting me with his gavel. When I finally got him, he cursed and kept screaming; “Oh God, why hast thou forsaken me?” at the top of his lungs all the damn way here. I felt like using the scythe on him. I haven’t felt like that since Caligula. Happily, Scalia was unavailable for comment. I LOVE your writing. I’ve got a LOT to catch up on.